If you’re looking for a pagoda umbrella then this surely has to be just about the most charming pagoda striped umbrella you will ever see. 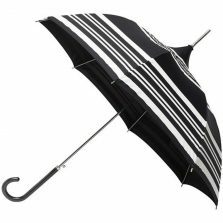 Ladies Pagoda Striped Umbrella Cream with Black Stripes. 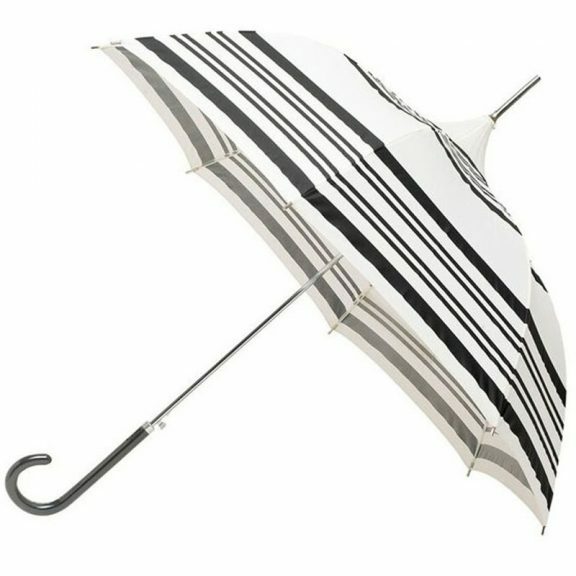 An extremely elegant full length ladies striped umbrella with a series of black stripes, in varying widths, around the cream pagoda shaped canopy. This umbrella and the rain, together really are a match made in heaven (Umbrella Heaven). This sumptuous umbrella has a polyester canopy which, when open has a span of 90 cm. When closed it is 90 cm long from handle to tip. 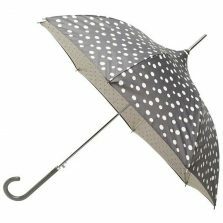 The umbrella itself has 8 panels, a steel shaft, fibreglass ribs, spike and spoke tips and and elegant fabric covered crook handle. It also features a push button automatic opening mechanism. 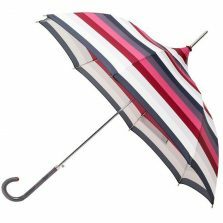 This umbrella really is a beautiful brolly that will keep you safe from the storm! Sometimes you need an exceptional umbrella for an extra special event. This umbrella will compliment the most important outfit you may ever wear – your wedding dress. It will protect you, your hair and your beautiful dress from unexpected downpours on your big day. It would also be the perfect accessory for a day at the races, garden parties, christenings, regattas etc. You name it this umbrella will suit the occasion. If you are looking for a wedding umbrella but this one is not quite what you are looking for then why don’t you take a look at our Wedding section. We have umbrellas in white, ivory, cream, with frills, flowers – whatever you may be looking for. Just click here and check out our range of wedding umbrellas. 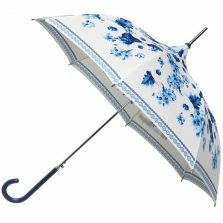 Or if it is pagoda umbrellas in particular that you are looking for, you have come to the right place. We have loads of them for you to choose from. Simply click to visit our pagoda umbrellas range and be taken to pagoda paradise!